With wide-screen laptops, travelers can really enjoy DVD movies on the road…at least visually. The letdown is generally the sound quality. Some laptops can’t even be heard across the room. Orb Audio is one answer that deserves a look. Orb Audio has created the theater sound we all want, but in a small form factor. Small enough even to take on your next road trip. Now, when the family sits down to enjoy a nice hi-def Blu-ray disc, the audio will be up to the quality you’ve come to expect. Each ‘orb’ is a four-inch, USA handcrafted ball with any of a number of metallic finishes. Each is rich sounding as well as rich looking – nothing cheap about these guys. For home, you can install 2 or more to your existing stereo amplifier for a true theater sound experience without giving up precious floor space. For the road, you can buy a kit with two Orb speakers and a mini amplifier, suitable for all your entertainment needs. The Audiophile PylePro will handle your i-Whatevers, CD players, MP3 players, as well as your laptop. There’s even a ¼” microphone input in case you can’t help but sing along. The amp puts out a nice 40W, room-filling sound with no perceivable distortion from the Orbs. The amp is only 2.76 inches high, 5.39 inches deep and 7.48 inches across, and works with any 110V or 220/240V system. Orbs can be purchased online at their website. 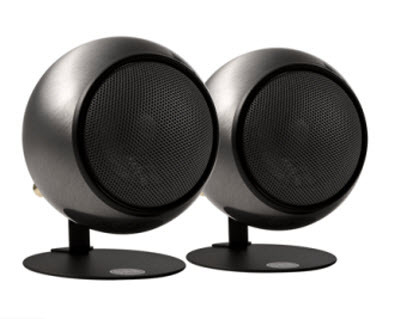 The special package of two Orb speakers and mini amp is presently priced at $299 and can be found here.